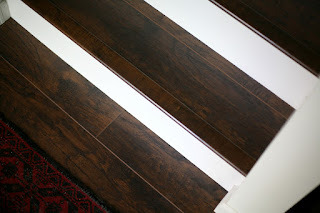 Possibly the biggest embarrassment of the Stanley 90's reno... we installed 1,574 SF of laminate flooring ourselves in a matter of weekends, but it took us almost a year of living here to finish the stair flooring!! I was dreaaaaaading installing the flooring on the stairs, because it's more complicated than the relatively easy install of the flooring on flat surfaces, then installing baseboards. 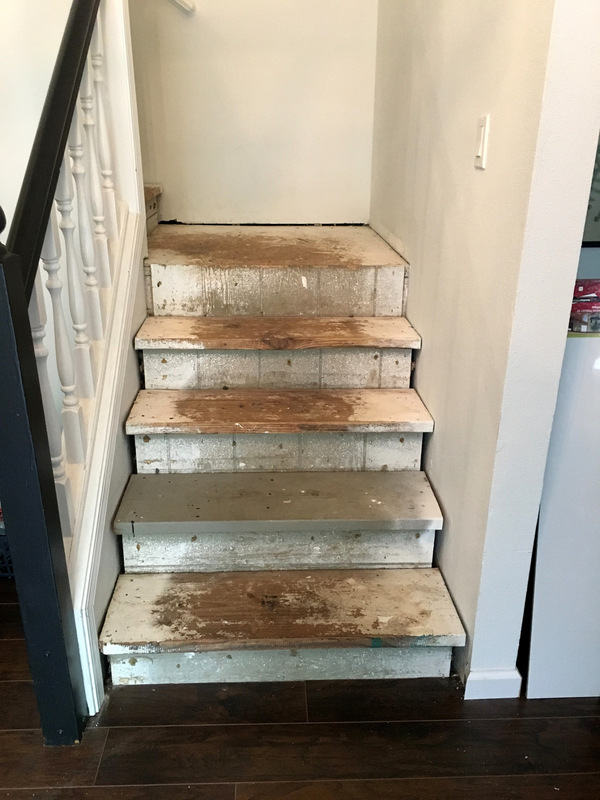 We ripped the carpet out immediately, then redid the floors, but we lived with the stairs like this for MONTHS. 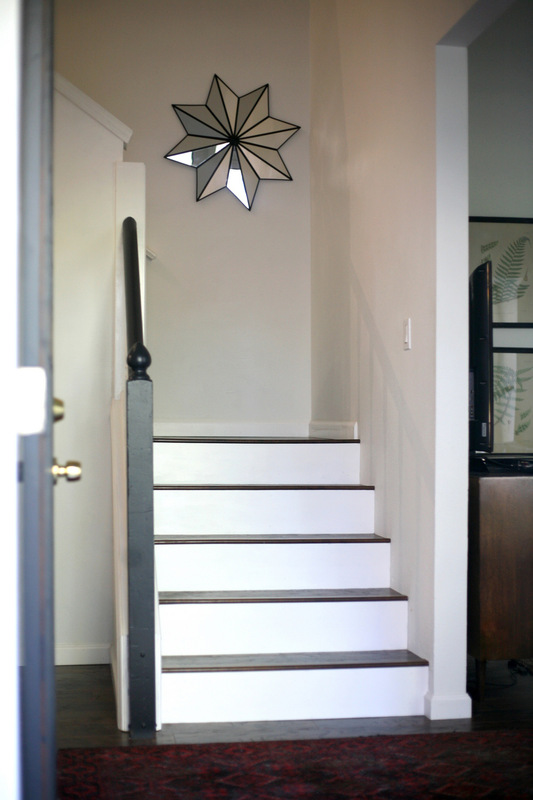 The first thing you see when you walk in the house! Yikes! 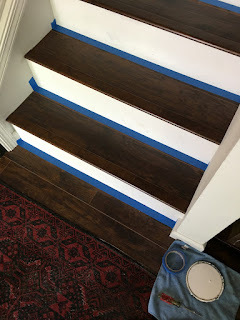 Installing the flooring meant using the same laminate (Woodland Hickory from Select Surfaces) plus matching stair noses, but it's more complicated than that. 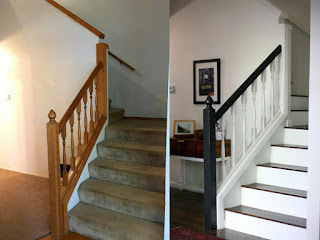 We didn't use molding or a stair-cut wooden trim piece on the edges, so the cuts needed to be pretty close to perfect. 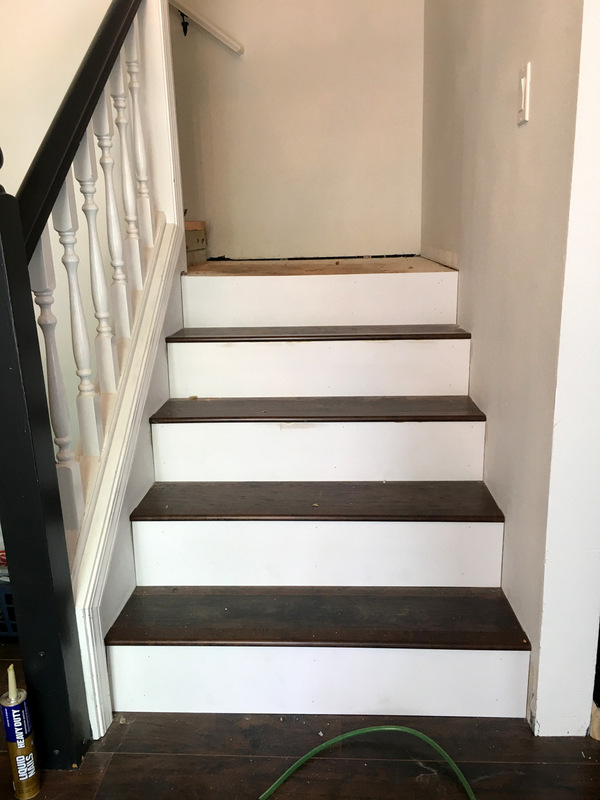 We both nailed and glued the laminate down on the steps. 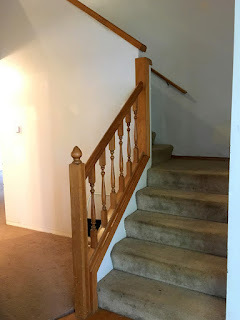 As you can see above, the stairs had overhangs which worked well with the carpet, but you either have to fill in the back of each riser or cut the stair noses off. We did the latter. It was a pain. 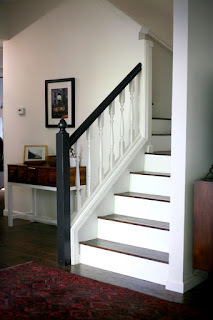 See in the picture below where the lips of the stairs (landing and one above) are trimmed. 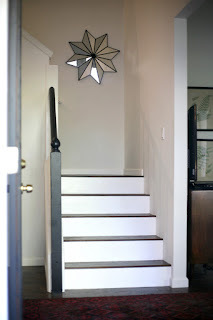 For the fronts of the stairs, I wanted to do a more traditional white riser rather than use laminate there, too. I found this pre-primed stair riser and bought 17 of them or whatever, and they did save us time from using a plain wood one, but they still had to be cut down to the right height and width, and then needed a coat of paint when done. 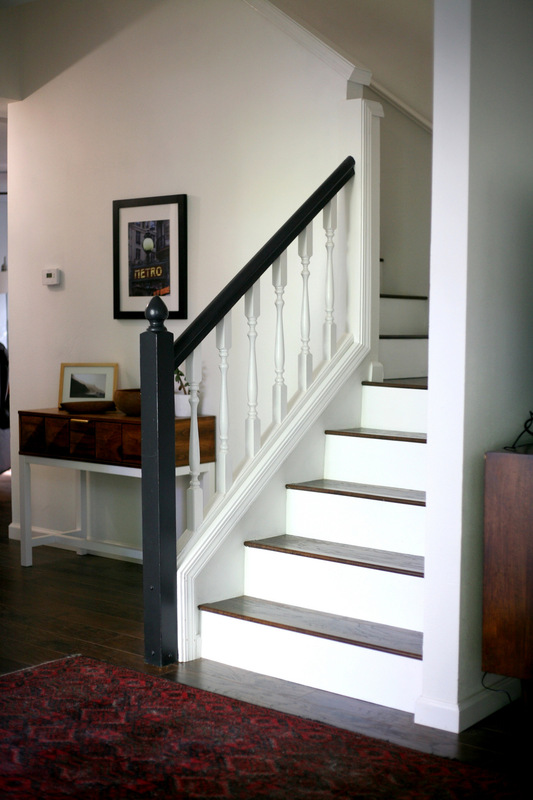 More baseboards. 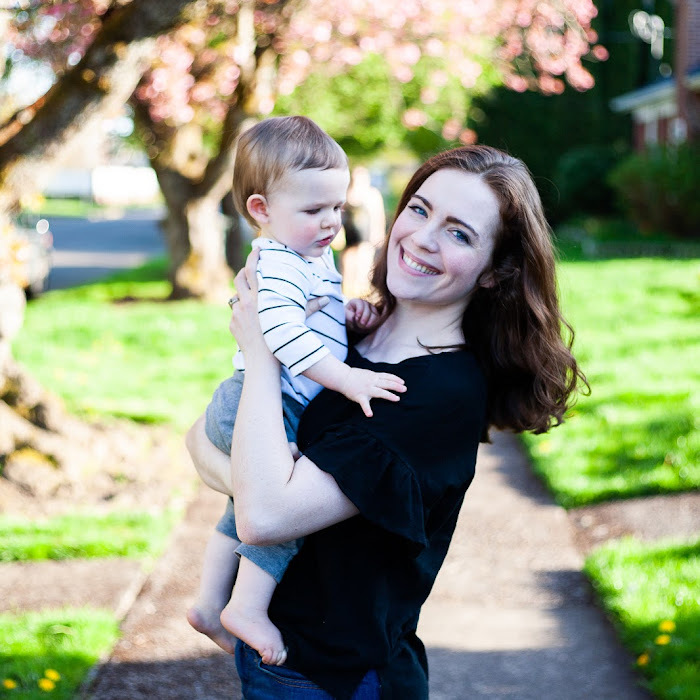 Oh, so much time spent on baseboards these days. Now we have an entry we can be happy to come home to! 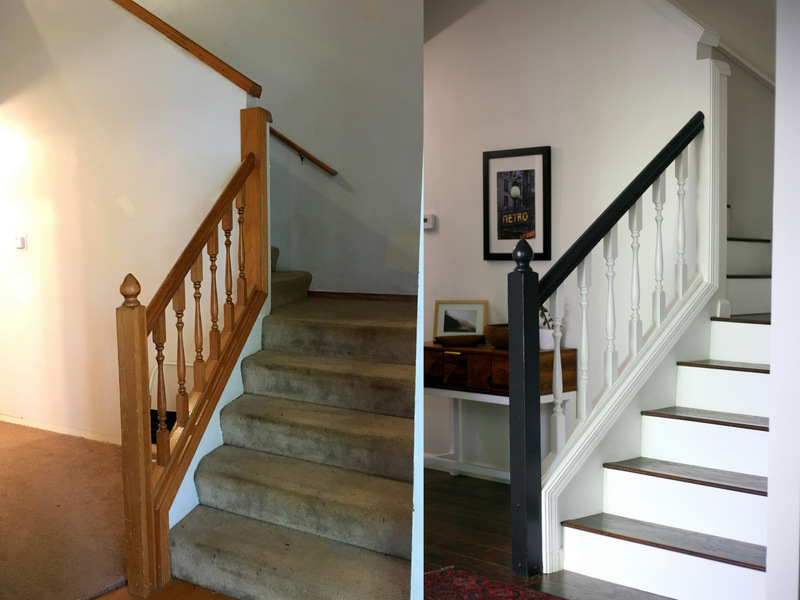 I LOVE that we have consistent flooring on both floors and the stairs, and I love the contrast of the white. Thanks to Select Surfaces for providing our flooring and stair trim pieces!